I may be disappointed with the lack of caring I feel is being shown to EverQuest II players by Daybreak/Columbus Nova, but that doesn’t mean I have stopped caring. I still do, even if I’m saddened. Thankfully, there are still EQII happy thoughts. And those happy thoughts are strong now! What better way to lift my spirits than with the festival celebrating my favorite holiday ever? Nights of the Dead has returned to Norrath, and I am going to revel in the glorious spookiness and collect all the goodies to adorn myself and my homes. I am celebrating Halloween in true Norrathian style, and you can too. After years of growing, there’s so much to do and so much to get in this festival that it’s a good thing we have until Friday, November 3rd, at 2:59 a.m EDT to mummy-wrap everything up! With so much, where do you start? An awesome part about the Nights of the Dead event is that you don’t have to start at any one particular place; you can participate from pretty much anywhere (collecting candies), and even better, at any level (most quests scale). A reminder mail sent to everyone in-game points out where major event activities are transpiring, but it’s still easy to miss something. To help ensure you don’t miss out on any old or new content, here’s a guide to 2017’s Nights of the Dead. Before moving into the nitty gritty of the festival, let me note that folks on the Stormhold Time-Locked Expansion server will have full access to Nights of the Dead — with the exception of the looted “A lost necklace” from The Hedge Hollow. Unfortunately for Fallen Gate, its time has not come: The only bit of the celebration this server gets is merchants in Freeport and Qeynos that will sell some of the holiday items. Important note: For the various howling achievements, you must have the special were-hunter helm equipped in your head armor or appearance slot. You buy it from the NotD vendor for 50 candy corns. Word is the snarling werewolf mask that you can select as a reward form the races also works. There are shinies to be collected during NotD, but it happens a bit differently during this holiday. First, you have to buy pumpkin bombs from the NotD merchant for two candy corns. Then you throw these bombs at players. The result is a scattering of small pumpkins that have to be collected/smashed for the Pumpkin Pulper achievement (you can’t pick up your own). Additionally, a random seasonal shiny from any of the five different collections will appear in your inventory. Completing the Deadly Remnants, Frightful Fabric, Crunchy Candied Crickets, and Ghoulish Masks collections will each reward a piece for the meta-collection, The Great Haunt. The final piece of this one is found via pumpkin bombs. When smashing the pumpkins you can on occasion get a title or a housing item instead of the shiny. The achievement for smashing goes all the way to 1,00. Those who throw the pumpkin bombs also get goodies, from titles to collectibles for the new Frightfully Frosted Cupcakes collection to housing items in their inventory. There is also a separate collection from purple shinies only available in the Hedge Hollow maze, so don’t forget to run that enough to finish it (or you can always buy missing shinies off the broker). Collecting candy is a pretty major component of this time of the year, and it is no different in Nights of the Dead. This candy, which is both a fuel for crafting holiday items as well as a currency to buy other holiday items, is found by looting kills anywhere in Norrath, collecting purple shinies, or sending out your ungraded pack pony to gather them for you (100 every two hours!). There is no way to list all the possible housing items and other goodies you can get from Nights of the Dead without taking up tons of space, but I’ll note a few. 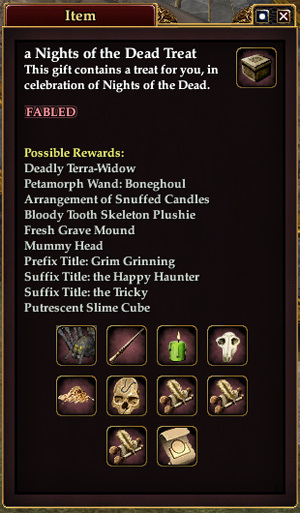 For instance, you can acquire a Deadly Terra-Widow familiar from the Waking the Dead event treat boxes — and you do not have to be level 100 to get it! The unfortunate trick that Daybreak has pulled on players is that the neat skin-worthy Halloween mount Kartob from last year (that you got from throwing pumpkin bombs) was removed and replaced with another that has more impressive stats, Baktor. Why was this a terrible trick? Because the idea of a “rare” mount went way overboard here RNG-wise: There are folks who have thrown over 2k pumpkins and still haven’t gotten this mount. And since many folks want the skin only, requests have been made to bring back the lower-level version at a better drop rate. Official response so far has just been Kander replying to concerns in Discord with, “It’s rare. I get that you don’t like that it’s rare.” Maybe you will be one of the lucky ones. Me? I doubt RNG would ever like me that much. Nights of the Dead has plenty of quests and events, all with spooky themes and awarding a selection of wonderful goodies. All quests scale to level unless otherwise noted. ( * indicates the quests are part of a chain tied to the one above). WFP gate Indefinitely Yellow ghosts reveal even more ghosts! Although the quest itself is located in Loping Plains, to start the This Wont End Well… chain, you have to visit either Freid Deekat (evil-aligned) or Skeer Deekat (good-alighned), but you can find these givers in all the major cities with housing. There are way too many to list in the chart, so here they are. The Wake the Dead event isn’t quite a quest, but it is necessary to participate in if you want to get the new 2017 quest Broken Mirrors. First, you must pick up a shovel found near one of the event graveyards scattered about the main cities. It is permanent and will auto-equips in your appearance weapon slot. Now, just click on the gravestones and “dig” them up to have a chance to getting a treat gift box with items or titles, ghosts you can talk to or fight, mobs, or the quest giver for A Forlorn Apparition. You just keep kep on digging to collect all the goodies you want from the treat boxes. Hedge Hollow is also a favorite activity that happens to grants oodles of XP and AA, which is why some Norrathians do it over and over. Of course there is all the loot from completing the A Nightmarish Return and Train to Zone! quests as reason to repeat it often as well as special items as drops (plushy from the harpy boss, Nightmarish Ceremonial armor set, and pants from the invisible armor set). And don’t forget the special collection quest inside. Hint: The end boss gets weaker the more mobs you kill, so leaving some behind is not always a good idea. Although I recommend doing Hedge Hollow without any guides or help the first time through in order to soak up the ambiance of it, future runs can be done more efficiently to save time. 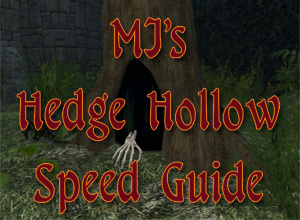 Having run Hedge Hollow many times over the years, I’ve devised a speed run to get through it quickly. To follow on your own map, you do need to have EQ2Maps. If you need the best thematically correct home for all those creepy decorations you are collecting, there are a number of prestige houses bought with station cash that perfectly fit the Halloween bill. Fright Manor is a rickety old house that comes complete with its own graveyard. The creepy Vacant Estate of Unrest has a secret passage behind bookshelves leading to a blood-spattered dungeon as well as a room with a pool of blood and a trapped floor. You can also get a non-dilapidated replica of the mansion used in the This Won’t End Well… quest line called the Uncanny Estate. I thought there was a haunted version as well, but I can’t seem to find it.